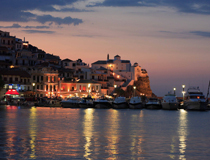 Bathing in the western Aegean Sea, Skopelos is part of the Sporades Islands group and is reached by boat from Skiathos. Skopelos's main port sits in a beautiful bay on the northern coast and the island's second largest settlement is Glossa on the northwest tip, about 35km from the main town. Amongst the 360 churches and chapels on this stunning island, one was made instantly 'world-famous' with the release of Mamma Mia in 2008. 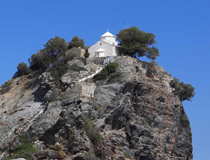 Indeed, who can forget the glorious wedding procession up the rocky peninsula/island to reach the tiny chapel of Aghios Ioannis? 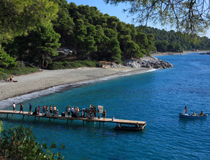 Read on for your chance to retrace the steps of acclaimed film stars and start planning your script for your oscar-winning wedding in Skopelos. The wedding procession of Mamma Mia is, without a doubt, one of the most romantic scenes of this world-famous and feel-good blockbuster filmed in Skopelos as well as Skiathos. Perched about 100m atop a rocky headland/island, no one knows when the teeny-weeny cute chapel was actually built. One of the various legends attached to it is that a local fisherman saw a bright light glowing on the sea rock and discovered it was an icon. Leaving it on the beach and looking for it the following day, he found it positioned once again on the rock next to a lighted candle. Following this unusual event, villagers decided that it was where it should belong and painstakinly built a chapel that they later named Aghios Ioannis. The scene filmed 'inside' the chapel did not actually take place at Agios Ioannis but on a replica set built for that purpose at Pinewood Studios, UK. 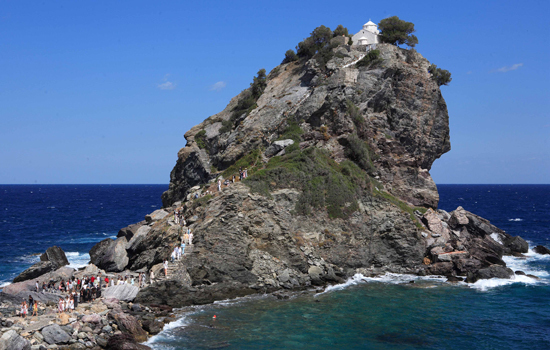 The one in Skopelos is truly minute and only Greek Orthodox couples can marry inside Aghios Ioannis. What we can arrange instead is a lovely civil ceremony outside this pretty chapel. 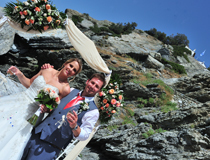 Surrounded by the deep blue sea with the most stunning views of Skopelos, this is a fabulous opportunity to surprise your guests and create your own script for your 'Mamma Mia' wedding! 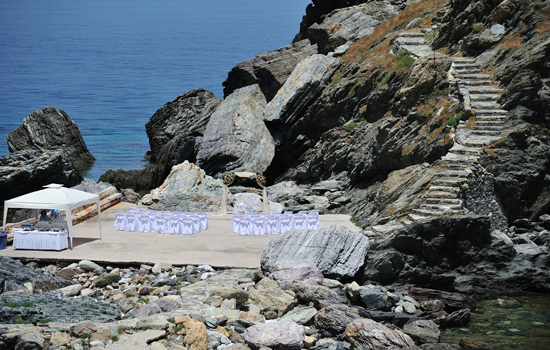 One thing you must remember is that if you have opted for the cliff top there are about 220 steps to reach this amazing wedding location! Get someone to carry your 'heels' and change into them (if you so wish) once you've made it to the very top in comfy shoes. And if you feel like bursting into an ABBA song half-way along the way... no one will stop you fulfil your dream. However, if the steep walk up the hill and the many steps is not going to suit some members of your party (it is a pretty tough climb! 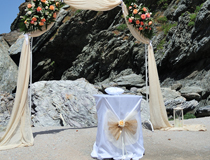 ), how about a lovely wedding ceremony set up at the bottom of the rock? (See large photograph below that was kindly supplied by Mr & Mrs Card on the June 2016 wedding). 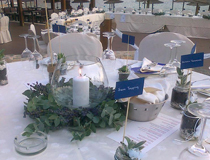 The concrete platform can be decorated as you wish and you still have wonderful sea views. 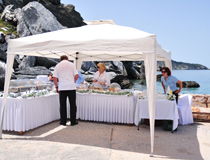 Needless to say that we can arrange boat transport for bride and groom and a picturesque taverna for your reception. 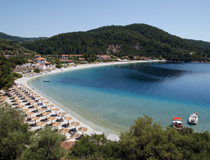 Located on the beautiful bay of Panormos, some 16km south-west of Skopelos Town, the Blue Green Bay is a small hotel that offers brides and grooms-to-be the chance to make the most of its perfect waterfront setting. 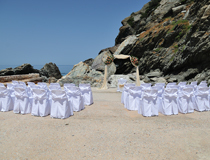 Not surprisingly, most couples choose to marry on the beach where the simple style ceremony can be tailor-made to your wishes. 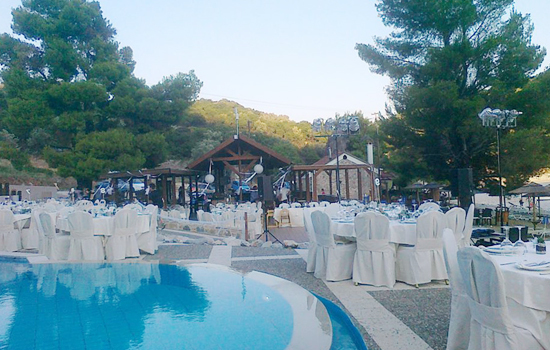 Following the chance to pose for wonderful sea view photographs, your wedding reception can be organised by the poolside in the company of family and friends. And if you fancy a very jolly beach party afterwards, just say the word!